For me, two exciting features got added in the v0.4.x code base. 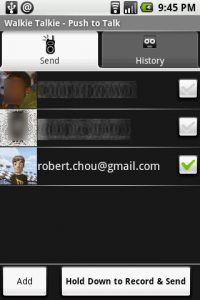 Contact photos are now displayed in both the Send and History tab. Contact photos are automatically retrieved/sync’d by Google. Send and reply with pre-recorded sounds (simply long press a recipient or a received msg). Lots of fun sounds effects and phrases are included. 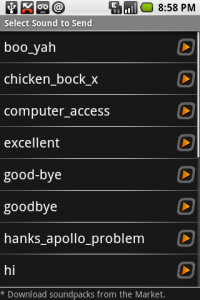 More sounds will be available later via sound packs. This entry was posted on Friday, February 27th, 2009 at 8:45 pm	and is filed under Walkie Talkie. You can follow any responses to this entry through the RSS 2.0 feed. Responses are currently closed, but you can trackback from your own site.